• Hawkman's mission to uncover the secrets of Thanagarian weapons on Earth leads him into the path of a deadly of Xerxes! The wonky grammar in the last sentence not withstanding, there is a lot of stuff to whet one's appetite in this solicitation. First off, the Shadow Thief! Man oh man, do I like the Shadow Thief. And this version of Hawkman, a very... hands-on sort of hero, will be double frustrated by the Thief's lack of dimensionality. Will it be Carl Sands, or will it be a new Thief? We have to wait and see. Well there you go. Dr. Fate! To say I am excited to see a new Dr. Fate is a bit of an understatement. I imagine that Juan over at the Tower Of Fate is equally excited. I have been in the mood for some magical comics lately so hopefully this will help me scratch that particular itch. • Green Lantern! Green Arrow! Catwoman! Katana! Vibe! Hawkman! Stargirl! They aren't the world's greatest super heroes—they're the most dangerous! But why does a team like the JLA need to exist? What is their ultimate mission? And who is pulling the strings? The new Justice League of America debuts in flashy fashion, with 52 variant covers -- one for each state of the union! (You'd better believe I intend to buy the SC one!) 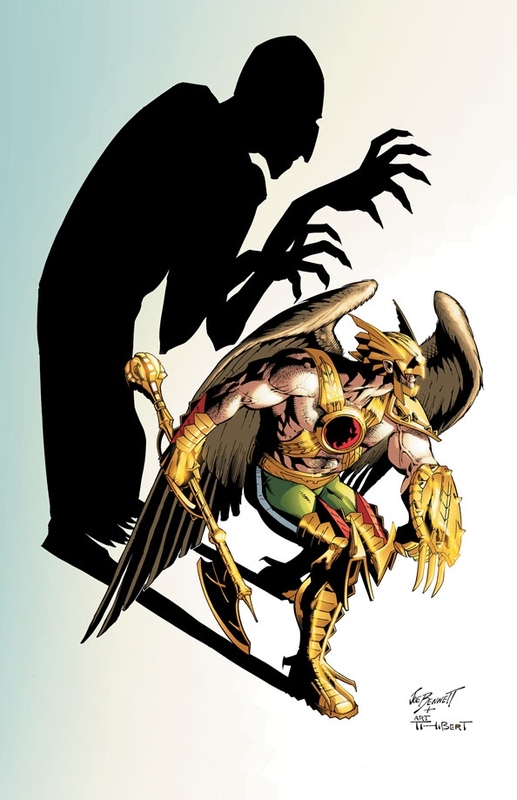 What brings this team together is anyone's guess, and what Hawkman's connection will be has be intrigued. In addition, we also have solicits for the new team over on the book of Hawk frenemy Green Arrow, Katana's solo book bowing (with a reference to the Outsiders?! ), and Vibe's starring turn. Sounds like some strange things are afoot in the DCU! Image: The Savage Hawkman #17, 2012, Joe Bennett. Sorry about last week, but we're back with more of Hawkman Families from NightwingTAS! 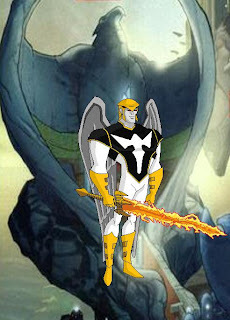 "Zauriel was assigned a new charge by the Presence, something he never knew existed." Hey everyone! In honor of Veterans Day coming up here in the USA next week (November 11th, though it is being observed on the 12th this year due to it falling on Sunday), I am going to be reading War comics all through the month of November! And I want you to get in on it as well. While War comics are a tiny subgenre now, they used to be a thriving part of the comics markets both here in the United States as well as in the UK and continental Europe. While War comics are often derided as jingoistic or simplistic, some of the most compelling and human stories of war are told in their pages. Many of the most popular War comics including Sgt Rock, Haunted Tank, Nick Fury & His Howling Commandos, the Unknown Soldier, and others were written and drawn by veterans who drew upon their experiences to show both the horrors of battle and the courage and bravery of the soldier. As a comics fan I think that raising awareness of these stories is a small way to honor the service and sacrifice of our servicemen and women who have sacrificed and continue to sacrifice in order to protect us and our way of life. I am using the hashtag #WarComicsMonth on Twitter and Google+ to share my thoughts and I need your help to keep the discussion going. So please feel free to read or promote your favorite War comics stories and use the hashtag to get in on the topic. I will RT or Share any posts I see with the hashtag. A great source for pre-Code, public domain War comics (along with tons of comics from other genres) is Comic Book Plus, which has a built in reader so that you can read the comics right in your browser. Plus they are all free and legal. Thanks for listening and I hope you will take a few minutes to read, tweet, and share your thoughts on your favorite War comics.